The other day I was taking some photos for a local CrossFitter friend who has developed a line of clothing call BroFit Box Apparel. Even though they decided to target men, which is obvious by the name, they thought they better add a few ladies items as well. So a couple of ladies from my box came by one afternoon to do a few photos. One of them happened to mention that they wouldn't be opposed to taste testing anything I had going on in the kitchen. Luckily for her I happened to know she loves brie so I whipped these little tasty treats together. That morning I had roasted some of my grape tomatoes to have on hand for salads, sauces, eggs, etc. and I knew they would go perfect. This is a quick and easy dish and is a perfect afternoon snack! Put brie in a medium bowl. Smash up using a fork and then add in the salmon. Mix well, continuing to smash the mixture with a fork if necessary. Generously salt and pepper to taste and then add a splash of lemon. 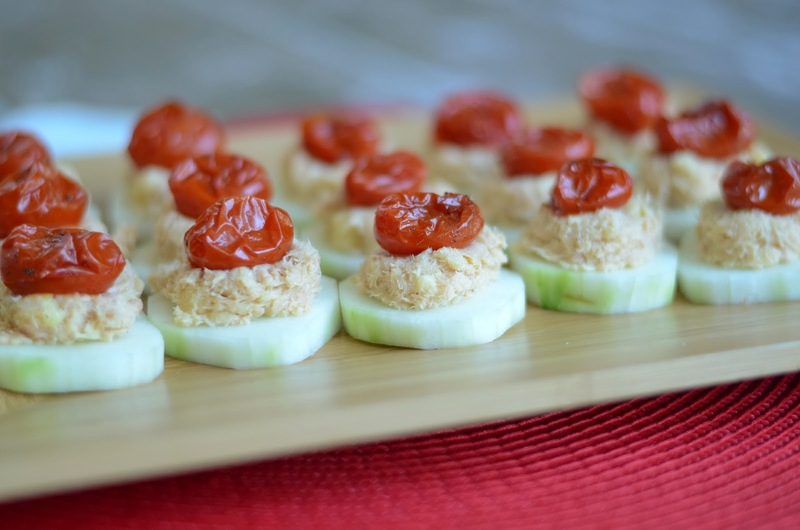 Place the brie mixture by tablespoon full onto each cucumber round and then top with one roasted grape tomato. Garnish with fresh ground pepper. And yes, she loved them!